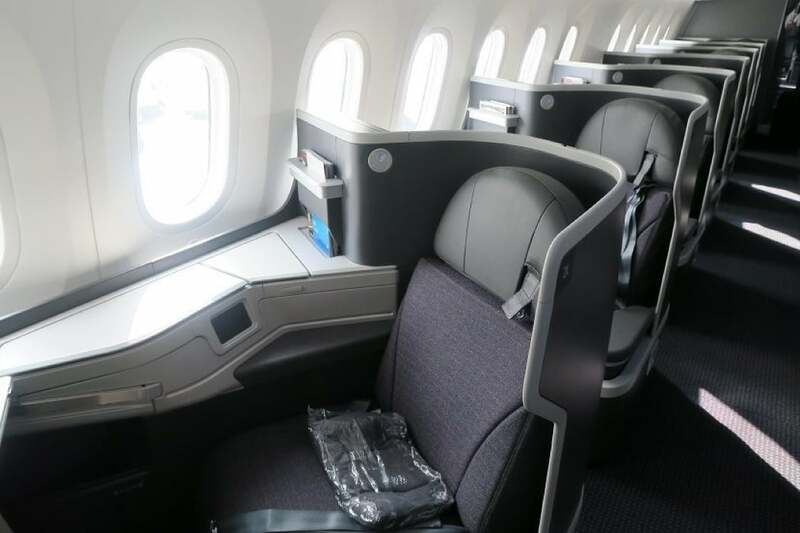 In this report, I review my flight DFW-MAD on American Airlines in their Super Diamond Business Class seat and cabin on their new 787-9 Dreamliners. These seats are the main feature of their new long haul Business Class cabin and the same new seats will also be installed on the Airbus A350 that American has on order, as well as being retrofitted on their Boeing 777-200s. This means that existing 777-200ER and 787-8 planes are currently the ones to avoid on American Airlines. 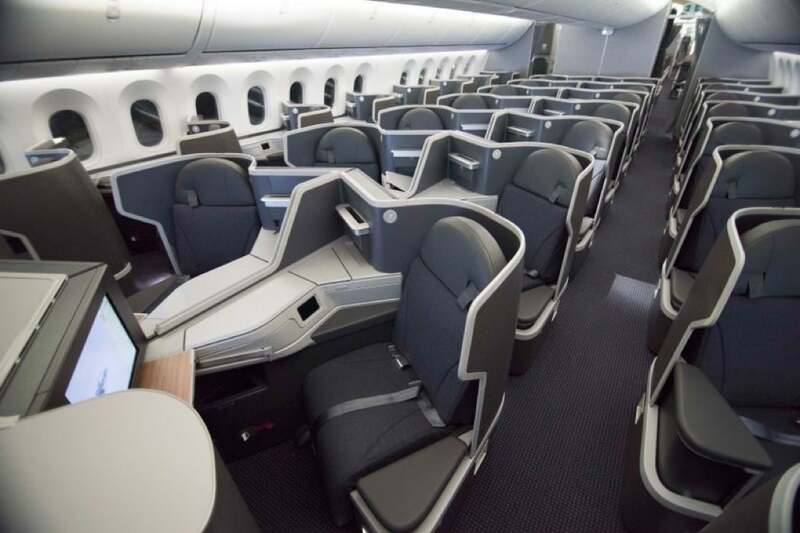 Dreamliner Super Diamond Seats And Cabin On AA? The new Super Diamond outward-facing herringbone seats are lie-flat and offer large entertainment screens, while the cabin is airy and contemporary (although not as trendy and stylish as the new Polaris cabin on United). Each business class seat reclines into a fully flat position instead of the dated angled partially lie flat design, which is still installed in many of American’s international fleet. The Super Diamond seats offer better sleeping space as well as aisle access and are similar to the popular Cathay Pacific seat. Each seat offers direct aisle access with a 1-2-1 layout which means the window seats are perfect for solo travellers while the middle seats are ideal for couples. There is loads of storage and, pleasingly, windows go completely black at the touch of a switch. These Super Diamond lie-flat seats are very private with a shell that blocks your view of the rest of the cabin. If you are over 6 foot, you may find their length a problem and may have to concertina your legs when trying to lie flat. There was also a pillow and blanket provided. The Best And Worst Seats On The Dreamliner? If you like window seats, avoid rows 5 and 8, which only have one window, the other Business Class window seats have 2 windows. The best seats, IMHO, are the window seats in all except rows 5 and 8. For me, the worst seats in the cabin are all the middle seats if you are travelling solo as there is currently no divider between the middle seats. There is a large in-flight entertainment screen in the Super Diamond seat with hundreds of movies, TV shows, music selections and games. Panasonic Wi-Fi is available on the Dreamliner which has a usable speed. My flight departed at 5:45 pm and was 8 hours 50 minutes in length. 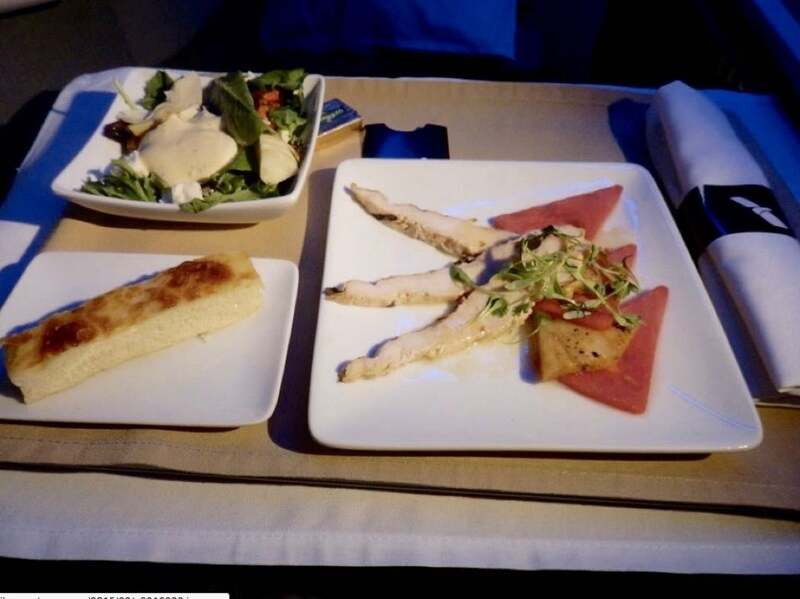 Dinner service started soon after takeoff, and the courses were served in quick succession. Food was quite delicious. The starter consisted of Thai chicken with grilled five-spice pineapple, watermelon and Asian mint dressing. It was served with a house salad with artichokes, roasted tomatoes and feta cheese, with a choice of creamy Italian dressing or balsamic vinaigrette. 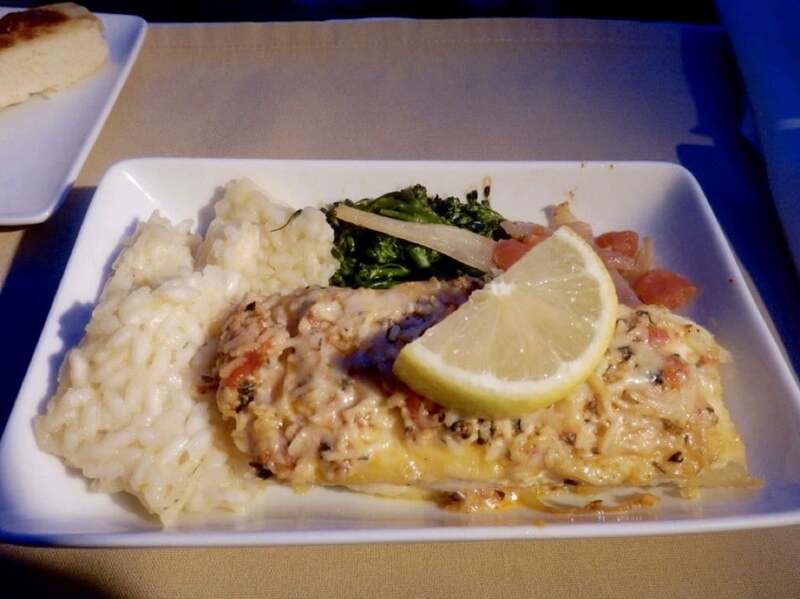 As an entrée, I choose the seared halibut with gremolata, with sautéed tomato fennel, lemon risotto and broccoli. For dessert, I ordered the Black Forest mousse cake. After the main meal service, a walk-up bar stocked with snacks and refreshments was set up in the galley for Business Class passengers. It was a very nice spread of a large assortment of snacks that was constantly replenished during the flight. 60 minutes prior to landing, breakfast was served. I just had a fresh fruit bowl, with granola and yoghurt and a coffee from a real ceramic mug. The Amenity kit had travel essentials from leading skincare and lifestyle brands Cole Haan. This is one of the best Business Class experiences on American Airlines with an excellent and private fully flatbed in an appealing (although not trendy) cabin. 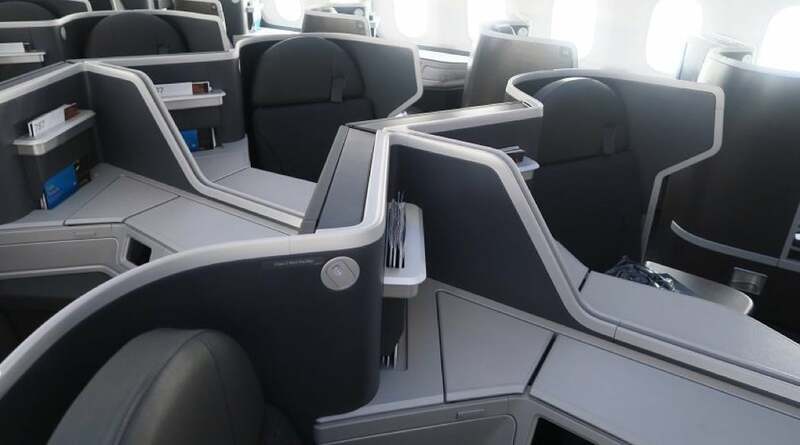 B/E will also be fitting new seats on the American Airlines Airbus A350, including their exciting new American Airlines Premium Economy which will also be rolled out on American’s 777, 787, A330 and A350 fleets. American Airlines have just launched a new Business and First Class amenity kit but it is not noteworthy when compared to the best airline amenity kits. Read my other American Airlines flight reviews, my review of the best new Business Class Suites on Delta, United and American Airlines and my top 10 Best Business Class airlines for long haul travel.